Kebo Dees swims in a chlorinated swimming pool. He probably got a bath when he got home because pool water is very drying to a dog’s skin. Kris Dees. Two new foster dogs arrived yesterday and I was reminded again of how poor the skin and coat of a newly retired dog can be. These two were flea-bitten and scruffy. The female has a bad case of dandruff and dry hair. The male is bald on his thighs, chest and neck, has danduff, several scabs and a few “bed sores”. They certainly are a long way away from the silky-coated pets they will become! Many new adopters of greyhounds find their dog has some kind of skin problem. Simple, dry, flaking skin and a dry coat are problems we see with many retired dogs. Most likely these problems are a direct result of the diet they get while at the track and should improve over time once they are placed on a top quality dog food. The areas worn off by inadequate bedding will recover nicely once the dog starts sleeping on a soft bed-preferably yours or at least the couch! I recently tried a nutritional supplement with my foster dogs designed specifically to improve dry skin and coat conditions called Linatone Plus. The additive provides dogs with linoleic acid, and other essential fatty acids which the canine body is not able to synthesize for itself. Linatone Plus also contains zinc which is supposed to help in the utilization of the linoleic acid. The product is fairly expensive (costs around $17 for a 32 oz. bottle from mail order companies and about $34 at retail prices) but it really seems to work and you can discontinue using it once the dog’s coat is in good shape. A cheaper alternative is to take the American Greyhound Council’s recommendation and simply add up to one tablespoon of corn oil per day to the dog’s food during the winter to counteract dry skin (if the dog get diarrhea, cut back on the amount of oil). Another common problem seen in retired racing greyhounds is “bald thigh syndrome”. If your dog arrived with bare thighs and possibly a bare neck, chest and stomach and the hair has not grown back in within six to eight months, your dog’s thyroid gland may not be secreting sufficient amounts of thyroid hormone. The low-thyroid dog may also be more sensitive to the cold than your other dogs, have a low energy level and an erratic appetite. You should take your dog to your veterinarian and ask him to perform a T-4 test to determine whether your dog is thyroid deficient. If the dog’s thyroid levels are low, he will be placed on replacement thyroid medication. Give the medication time to work. You may not see immediate results, but should expect to see a great deal of improvement after about six months. If your dog starts to shed, don’t panic! This is a good sign. It means that new hair is growing. The hair may not grow back completely but your dog’s sensitivity to the cold should be reduced, its energy level increased and its appetite improved. You should expect to return one or two more times for additional T-4 tests while the vet figures out the optimum dosage for your dog. Once the dosage is set you can get bulk quantities of the medicine from your vet or from mail order catalogs (with a prescription) for a very reasonable price. Two of our greyhounds are low-thyroid dogs and we have seen significant improvement in their coats, tolerance for the cold (I still put sweaters on them to sleep in, if the nighttime temperature in our house dips below 65 degrees), energy levels and appetites. We strongly urge anyone who suspects their dog has a low thyroid condition, to bite the bullet and have the dog tested. Your dog will feel better and so will you! Another cause of skin problems can be allergies. If your dog has irritated skin and is constantly scratching himself, he may have allergies. Dogs can be allergic to various foods, grass, pollen, plastic and so on. You can try switching him to a hypo-allergenic food, but allergies are best dealt with in consultation with your veterinarian. He or she can prescribe various medications to control the itching and can also test your dog to find out his specific allergens. The final cause of flaky, irritated skin we have run across is caused by an allergic reaction to fleas called flea dermatitis. Fleas usually congregate near the base of the tail and this is where a dog who is allergic to fleas will experience irritated skin and eventual hair loss. PLEASE keep the flea population on your dog, in your home and yard under control. Keep your grass cut short. Use a pyrethrin-based flea spray on your dog and spray your carpets, furniture, dog bedding, etc. with a pyrethrin-based premise or carpet spray. The better brands include an insect growth regulator (IGR) chemical which keeps any pre-adult fleas from developing into adult fleas for up to six months. These are long lasting products which give safe and economical flea control. (Two good brands are Zodiac FleaTrol and Vet Kem. Remember, never use a flea collar!) Not only will your dog not have his delicate skin irritated by the fleas, he will not be at risk of contracting tapeworms by eating a tapeworm-carrying flea. If you see white, flattened rice-like segments in your dog’s stool, he has tapeworms! Get a fresh stool sample (a teaspoon will do) to the vet (some vets will take your word and not require the sample) and have him treated. DO NOT treat him yourself, using over-the-counter wormers. These medications are highly toxic to the sensitive greyhound and you may over-medicate (poison) your dog. Please also don’t overlook the obvious. Regular grooming is important. 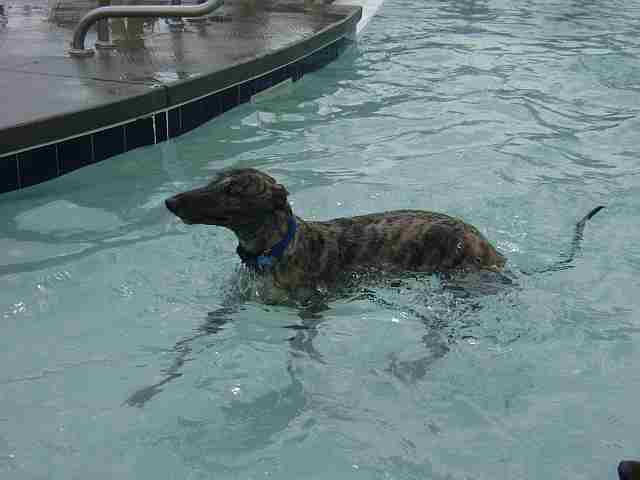 Yes, even greyhounds need to be bathed! If they smell, they need a bath. Use a good quality dog shampoo (human shampoo can be too drying) and brush your dog regularly to remove dead hair and stimulate his oil glands. The most effective grooming tool I’ve found to date is a pink rubber curry comb called Zoom Groom which really strips out the dead hair. My dogs also love its massaging action and line up to be brushed whenever I bring it out! So, in closing, don’t despair over your new dog’s scruffy appearance! With a little time and effort you will get his dry, flaky, irritated skin into good shape and turn his scruffy coat into a silky, soft coat any greyhound would be proud to wear. Ed Note: Today’s reader has many more flea products to chose from but the advice still stands about using pyrethrins vs non-greyhound-safe products such as permethrins.